Summer would not be the same without some of my favorite foods: barbecued ribs, potato salad, coleslaw, and ice cream. If we cook up a batch of ribs, we must have some potato salad on the side or the meal just doesn’t feel complete. 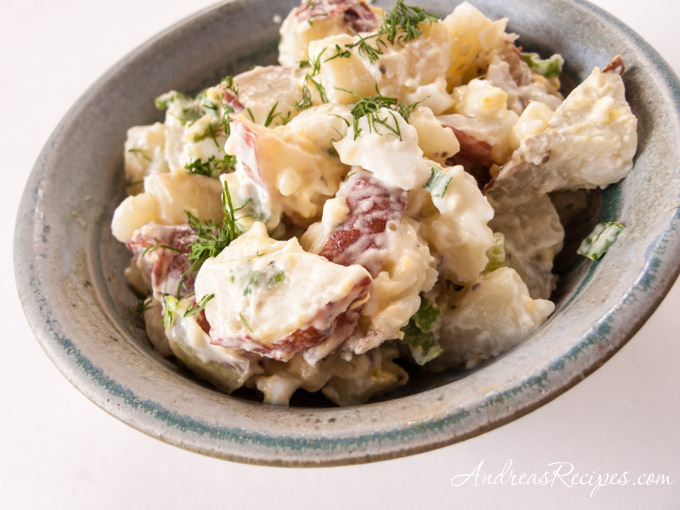 When we first got married Michael wanted me to learn to make hot German potato salad, which uses a vinaigrette for the sauce, so I learned and enjoyed making it for him, but once he tried this mayonnaise salad it became his new favorite. Many potato salad recipes call for boiling the potatoes, but I prefer to use steam instead because they do not get water logged and they retain their nutrients rather than pouring them out in the water. You want the potatoes to cook evenly and quickly, so use small red potatoes and make sure they are all the same size. I boil water in an electric kettle because it’s very fast, then pour the hot water into the bottom of a 6-quart pot and add the steamer basket, arrange the potatoes in a single layer and let them cook covered while the water boils beneath. Steamer baskets are inexpensive and widely available. For boiling the eggs I recommend the Cook’s Illustrated method. Cover the eggs with cold water, bring to a boil, turn off the heat and cover and allow to sit in the hot water for 10 minutes. Then place the eggs in an ice bath for five minutes to stop the cooking. As long as I don’t forget about the boiling egg (must remember to use the timer), it cooks perfectly without any gray-green slime around the yolk. Makes about six cups of potato salad, enough for 8 to 10 servings. 1. STEAM POTATOES: In the water kettle, bring water to boil. Pour into the pot just until the water touches the bottom of the steamer basket. 2. Place the potatoes in the steamer basket in a single layer. Cover and steam for 15 to 20 minutes, or until they are tender. You can test with a bamboo skewer. Potatoes should be cooked all the way through, but not mushy. Remove potatoes from the pot and allow to cool to room temperature. 3. COOK EGGS: While the potatoes cook, place eggs in the 2-quart saucepan, cover with 1 inch of water, and bring to boil over high heat. Remove the pan from heat, cover, and let sit for 10 minutes. Just before the eggs finish the sitting time, add 1/2 cup of ice and 1 cup of cold water to the medium bowl. Transfer the eggs to ice water bath with slotted spoon and allow to sit 5 minutes. 4. SAUCE: While the potatoes and eggs cool, stir together the mayonnaise, salt, and celery seed in a small bowl. 5. COMBINE: Peel the eggs. Cut the potatoes and eggs into small pieces and put into the large serving bowl. Stir in the onions and sauce until it is thoroughly distributed. Garnish with dill leaves and serve. Store covered in the refrigerator for up to two days. Other chopped vegetables to add: celery, pickles. If you decide to add more vegetables, remember to increase the amount of mayonnaise, salt, and celery seed accordingly. If you like a little spice in your potato salad, add 1 tablespoon Dijon mustard or 1 teaspoon prepared horseradish to the mayonnaise mixture, or use a little sour cream. Yes, yes, yes – got to have the potato salad with the BBQ!! And ribs – absolutely!! Looks like excellent potato salad. Hi Andrea. Very nice salad, I was browsing through your site and the lovely recipes, so ended up commenting at the salad recipe. You have some great food work there. BTw, I Would like to invite you to participate in the ONE DISH MEAL – Salad event I am hosting. The rules for it are in my website. Would love to see an interesting recipe from you. Thanks. Thanks for this recipe, I just made it for dinner. I had russet potatoes on hand and they worked out just fine. It was the best part of our meal. Jeanology, I’m so glad to hear you enjoyed the potato salad! Really? I love the vinegar-based potato salads. They’re quite healthy, too, in comparison. My most recent version has spinach and sugar snap peas to add green vegetables to it (http://groundcherry.wordpress.com/2011/05/28/red-potato-and-sugar-snap-pea-salad). The eggs are a great idea– mine could use a little more protein, and that’s a perfect way to add it.